Don't let the cold weather kick your creativity. Some celebrities are doing more than simply grabbing their coats on the way out of the door. They, along with their stylists, are thinking of new ways to work weather-proof clothing into their outfits, thus creating standout street style. The resulting iterations aren't hard to recreate. With a few pulls and tugs, we're adding these new styles to our wardrobe arsenal, keeping our winter wardrobe hot, even when it's cold outside. 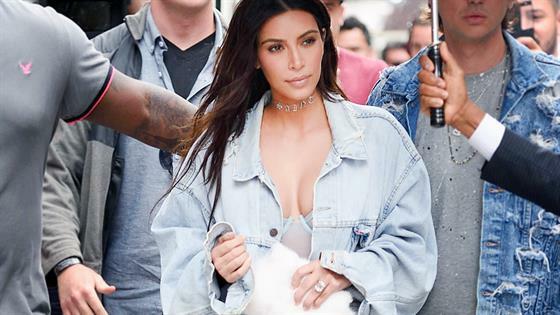 Case in point: Kim Kardashian's off-shoulder trench. The star adds to the sultry and mysterious notes of the classic garment by wearing nothing under, and pulling the shoulders down to reveal her décolletage. The belt keeps the new structure in place, so she doesn't need to use the buttons. Unbuttoned, the star reveals her graphic thigh-high boots and redefines the meaning of the coat dress. Chrissy Teigen takes a more subtle and popular approach while shopping on a rainy day. Instead having to take the coat on and off, the star drapes her coat over her shoulders, concealing her arms. Whether or not this style is warmer, this unconventional way of wearing outerwear actually seems more convenient for a busy shopper. Without the arms, the style also allows a better view of the outfit underneath. So, if you really love the T-shirt you're wearing, this iteration is the perfect alternative. Blake Lively is a fan of the no-arm trend as well, but adds to the style by adding another layer. Why wear one coat when you can wear two? Double coating is a perfect way to stay warm while looking like street style royalty. The key is to either match the hue or pattern of both coats like the actress, or contrast the colors (See: Kelly Rowland's double coating style). Either way, this addition makes a big impact. According to Sofia Richie, your outerwear doesn't always have to go over your outfit. The model wears her three-toned Puma jacket under her overalls with heeled ankle boots for a feminine touch. Beyond ditching the standard layering sequence, she opts out of the one of the overall straps to display more of the jacket—pretty genius. The style is warm with layers, chic with its approach and a winter go-to for the overall lover. Which style will you try this season? Tell us below!